Here is a list of deals for Black Friday Week 2015. These deals are live at the time of posting. I’m going to try my best to keep this post updated, but deals can and will expire at any time. Please comment if you find a deal that does not work. However, be SURE you have read all of the details regarding how to snag the deal. Some deals are more complicated than others! KitchenAid Classic 4.5-Qt Stand Mixer Only $108.74 (Reg. $299.99) After Rebate & Kohl’s Cash! Ninja Master Prep Blender On Sale! Keurig K45 Elite Coffee Brewer Just $61.49 After Coupons and Kohl’s Cash! Kohl’s: Barbie Store It All Case Only $17.84 (Reg. $29.99)! Step2 Modern Cook Kitchen Only $50.99 Shipped (Reg. $129.99) + $15 Kohl’s Cash! Kohl’s: KidKraft Dakota Dollhouse Only $67.99 Shipped (Reg. $99.99) + $15 Kohl’s Cash! Kohl’s: Playskool Mr. Potato Head Sets as low as $13.60 (Reg. Up to $49.99)! *HOT* Kohl’s: 8 Fisher-Price Toys Only $50 Shipped (Reg. $119.92) + $15 Kohl’s Cash! Kohl’s: 3 FREE Small Kitchen Appliances After Rebate! Best Buy: HP DeskJet Wireless All-In-One Printer Only $19.99 (Reg. $79.99)! *HOT* Target: 16-Piece Rachael Ray Cookware Set Only $89.99 Shipped (Reg. $149.99) + Tons More! DVD’s On Sale Just $4 Each – The Sandlot, Cloudy with a Chance of Meatballs, Dolphin Tale 2 and MORE! Target: Kids Graphic Tees as low as $1.80 Each! Target: Receive 20% Off Coupon when You Spend $75 In-Store or Online (Today Only)! American Girl – 20% Off Full Priced Merchandise Coupon Code! Microsoft Xbox Live 12 Month Gold Membership Only $34.99 (Reg. $59.99)! Cricut Explore One Cutting Machine Best Price! Barbie Pop-Up Camper Vehicle On Sale Today! Highly Rated Amazon Fire TV Stick On Sale! Canon PowerShot ELPH 160 On Sale! Little Tikes EasyScore Basketball Set On Sale! HOT* KidKraft Vintage Kitchen On Sale! Disney Frozen Toddler Elsa Doll with Reflection Eyes On Sale! Stanley 4-in-1 Pocket Screwdriver On Sale Less Than $5 with Free Shipping! Fisher Price Little People City Skyway On Sale! 50% Off Select Timex Watches – Prices Start at $8.55! Ugly NFL Christmas Sweaters On Sale for Every Team! Disney Princess Palace Pets, Bright Eyes featuring Dreamy On Sale! Kindle Fire Kids Edition On Sale – Plus a Monthly Payment Plan Option! LEGO Friends Pop Star Show Stage Building Kit 20% Off! Amazon Stocking Stuffer and Gift Ideas – American Girl, LEGO, Alex, Minecraft and More! Logitech Wireless Laser Mouse Just $9.99 (Reg $30.99) PLUS earn $5 in SYWR Bonus Points! 30% off Erin Condren Planners and Accessories! The Children’s Place: 50-75% Off Everything! Sale Live NOW! Gymboree 50% Off Black Friday Sale – FREE Shipping with No Min Purchase! Walgreens: FREE 8×10 Photo Print ($3.99 Value)! 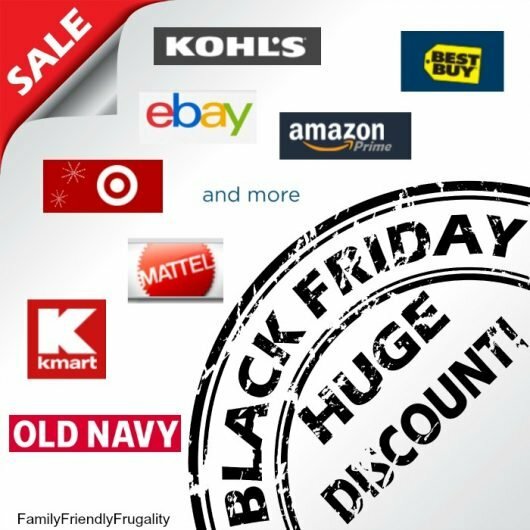 Magazine Black Friday Blowout Sale – US Weekly, Entertainment Weekly, Rachael Ray and More! Shutterfly: 50% Off Hard Cover Photo Books + 40% Off Everything Else! Bath & Body Works Buy 3 Get 3 Sale – Get 6 Items for $20!